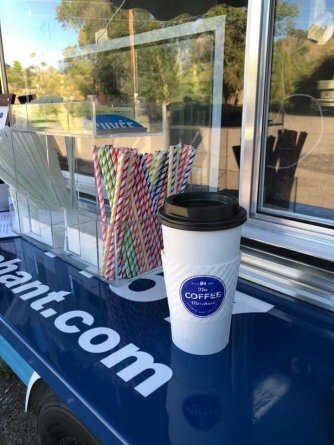 The Coffee Merchant features freshly-brewed coffee, espresso, loose-leaf tea and chai tea, lunchtime sandwich deals and more, all available with drive-up convenience! 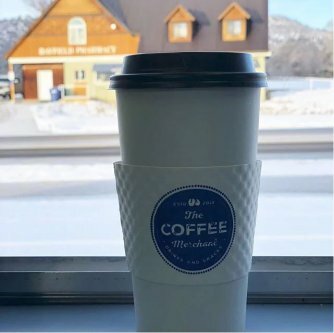 The Coffee Merchant provides drive-through convenience along with a great cup of freshly brewed java or tea. We also have fresh-brewed loose-leaf tea, along with full-flavor and lower-sugar chai tea. Need a shot of special flavor? We have Monin syrups. We are the exclusive source in this area of Cuvee Roasters coffee, selected in blind taste tests by Bayfield coffee lovers! Strawberry-banana, mango, coconut-pineapple smoothies, chocolate and vanilla frappuccinos are a great option to cool off during the summer. An avid coffee drinker? Earn yourself free drinks with our coffee sleeve program, for every 10 cups purchased, the 11th cup is free! Fresh bagels and cream cheese, Umpqua oatmeal, burritos and muffins, are perfect foods to get you started on your day. 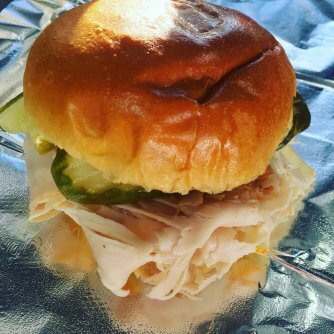 For lunch, our fresh-made ham or turkey sandwich are perfect for a easy to-go lunch. Each sandwich comes with a side of chips all for only $5! Along with paper cups, we use recyclable coffee sleeves and eco-friendly lids that use 30% less material by weight than the typical lid. The trailer is also equipped with solar panels to lessen the effect on the environment. Our straws are made from corn. And last but not least, our coffee grounds are composted and donated to the Pine River Garden Club! Welcome to The Coffee Merchant. I am really excited to begin this new journey in life. After being an elementary teacher for over 20 years, I have retired and am ready to embark on Coffee! My family and I have lived and worked in Bayfield, Colorado for about 20 years and have grown to love the families and community in our little town. One thing our town is known for is helping one another and supporting each other whenever there is a need. Because of this, I wanted to give a little back to our community. When I was teaching there were many mornings when I just wanted to run and grab a quick cup of coffee. Unfortunately, we didn't have a drive-up shop to just grab and go. This made me think that maybe other people felt the same way. Hence...The Coffee Merchant. The choices I have made for this business were focused on a healthy and environmental approach. The coffee is coming from acclaimed roasters not offered in this area. At this time, we are using Cuvee Roasters. Please come by and say, "Hi"!